The NASA/NOAA DSCOVR spacecraft captured this view of the moon crossing Earth's face in July 2016. Earth's moon is the brightest object in our night sky and the closest celestial body. Its presence and proximity play a huge role in making life possible here on Earth. The moon's gravitational pull stabilizes Earth's wobble on its axis, leading to a stable climate. The moon's orbit around Earth is elliptical. At perigee — its closest approach — the moon comes as close as 225,623 miles (363,104 kilometers). At apogee — the farthest away it gets — the moon is 252,088 miles (405,696 km) from Earth. On average, the distance from Earth to the moon is about 238,855 miles (384,400 km). According to NASA, "That means 30 Earth-sized planets could fit in between Earth and the moon." That wasn't always the case. Scientists think the moon formed when a massive Mars-sized object collided with the young planet. Gravity pulled the debris from the crash together to form the moon. Earth and its newly formed companion were 10 to 20 times closer together at their birth than they are now. "The moon and Earth loomed large in each others skies when they formed, " Arpita Roy, then a graduate student at Pennsylvania State, said in a statement. Today, the moon is moving away from Earth at a rate of about 1.5 inches (4 cm) per year. The moon is in synchronous rotation with Earth. In other words, the moon rotates on its axis in about the same amount of time it takes to revolve around Earth — 27 days 8 hours, which is called sidereal month. So we always see the same side of the moon; there is no "dark side of the moon." Instead, scientists refer to the side of the moon facing away from the planet as the "far side of the moon." 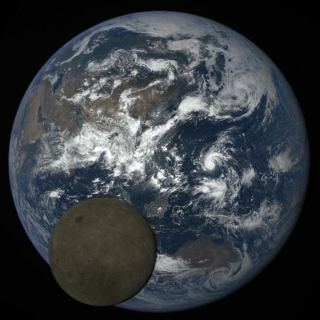 The far side can be spotted by missions such as NASA's DSCOVR satellite, which captured a video of the moon "photobombing" Earth. A lunar month, also called a synodic month, is the time it takes for the moon to complete a lunar cycle — full moon to full moon. A lunar month is about 29 days 13 hours. A range of factors determines how long it takes to reach the moon. Human missions, for instance, tend to take longer than passenger-free satellites. Whether or not an object stops at the moon or just zips by also comes into play. The USSR launched the first mission to the moon, Luna 1, in 1959. With no propulsion system, the sphere-shaped satellite was hurled into space, and took only 34 flight-hours to make the trip. After its flyby, the satellite went into orbit around the sun, between the orbits of Earth and Mars. This remains one of the fastest trips to the moon. "Operating SMART-1 has been an extremely complex but rewarding task," Octavio Camino-Ramos, ESA SMART-1 Spacecraft Operations Manager said in a statement. "The long spiraling trajectory around Earth to test solar electric propulsion (a low-thrust approach), the long exposure to radiation, the strong perturbations of the gravity fields of the Earth-moon system and then the reaching of a lunar orbit optimized for the scientific investigations, have allowed us to gain valuable expertise in navigation techniques for low-thrust propulsion." He called the findings "a remarkable benchmark for the future." NASA sent eight crewed Apollo missions to the moon, six of which landed successfully. (Apollo 8 was the first mission to orbit another body and Apollo 13's infamous disaster resulted in a journey around the moon rather than a landing on its surface.) Each spent about three days traveling through space. Apollo 8 took 69 hours, 8 minutes to enter orbit around the moon. Apollo 11, which placed the first humans on the moon, took 75 hours and 56 minutes to enter orbit around the moon. Long before they entered orbit, however, both spacecraft entered the moon's sphere of influence, a region 33,823 nautical miles (62,630 km) from the moon. For Apollo 11, this occurred after 61 hours and 56 minutes, while for Apollo 8 it took only 55 hours 40 minutes. But the quickest trip to the moon was the New Horizons probe, which zipped past the moon in just 8 hours 35 minutes. The spacecraft didn't even slow down or approach lunar orbit but instead zipped by on its way to Pluto. Tides occur because of the gravitational pull of the moon. The oceans bulge in the direction of the moon. High tide happens when the moon is overhead, but it also happens on the opposite side of the planet because the moon is tugging on Earth as well. Spring tides — so called because the water "springs up," not because of the season — occur when the moon, the sun and Earth are aligned, during a full moon or new moon. The moon isn't the only celestial body pulling on Earth's water. "The moon is a major influence on the Earth's tides, but the sun also generates considerable tidal forces," according to the National Oceanic and Atmospheric Administration. "Solar tides are about half as large as lunar tides." The gravitational forces of the moon and the sun both contribute to these especially strong tides. Neap tides are weak and occur during quarter moons when the forces of the sun and the moon are perpendicular to each other.